It’s been a while since my last post, summer has kept my whisky drinking to a minimum in favour of cold beers and ciders. However, continuing my wee series on affordable, mainstream, ‘standard’ distillery offerings that I’ve purchased myself, let’s take a look at Ardbeg’s 10 Year Old, a perfectly good dram for late on a summers eve. Gossip (which I’ve heard direct from the horses mouth as it were – i.e. it’s true) is that back when stocks were low whisky up to 17 years old was used to keep this 10 year old in the shops. I guess those good old days are now far behind us and we’re now back to whisky that’s much more of the 10 year old mark, as you’d rightly expect! Nose: Peat! A fairly medicinal peat, a clean and crisp nose with fairly fruity smoke. 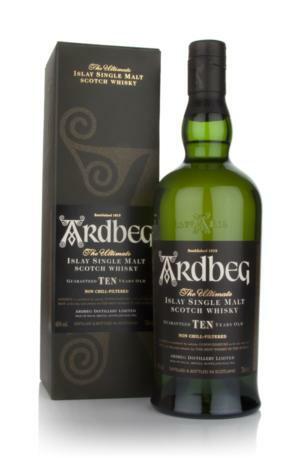 An easy to nose Ardbeg, fairly alluring. Palate: Accessible and mouth coating with oil. There’s peaty mossy oak notes with touches of salt and a fair bit of tcp / iodine. It’s fairly sweet with vanilla fudge notes and touches of tar. Finish: Easy, reasonably sweet, a little fruity and long with a vanillary peat smoke lingering. Water: Doesn’t need any. There is a small amount of spice here, and water will help with that if it gets too much for you however. Thoughts: Amongst the best standard drams on the market, packed with quality. An iconic Islay dram which sets the bench high in the range with this entry level offering.